Pirates who attacked a ship off the coast of Somalia got more than they bargained for when it turned out to be a naval vessel – from an international force against piracy, Nato said today. The pirates apparently mistook the FGS Spessart for a commercial merchant ship when they targeted it in the Gulf of Aden, between Somalia and Yemen, yesterday afternoon. The German supply ship pursued the pirate boat, joined by two other ships, a frigate, a helicopter and a plane. A boarding team discovered several weapons and transferred seven suspects on to another German frigate. Nato said the detained suspects will remain on board until a decision is made as to where they will be prosecuted. Ok, had there been tales of overwhelming gunfire from the German ship, with the pirate ship exploding and going down in flames, as burning Gollies had to leap into shark infested waters to extinguish themselves, only to find out that sharks like them better half toasted, then it would have been a perfect story. But I’ll take it this way. 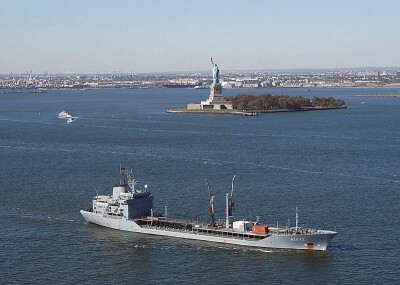 FGS Spessart is an auxiliary ship to the German Navy. 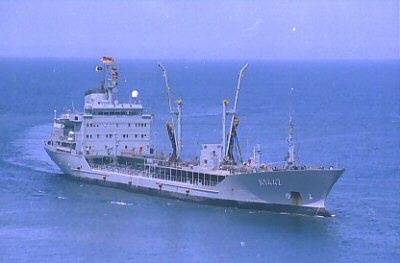 It is a fleet oiler, manned by a civilian crew. I guess the pirates didn’t realize the blue-grey paintjob with the big white numbers on the side was a dead give away that this wasn’t a civilian merchantman. USS BOXER, At Sea – In a show of international sea power in the Gulf of Aden, seven nations representing three task forces coordinated efforts to pursue a skiff after the pirates on board opened fire on a German oiler, the Federal German Ship (FGS) Spessart, March 29. At approximately 3 p.m. yesterday, FGS Spessart, reported that they were being attacked by pirates who may have mistaken the naval supply ship for a commercial merchant vessel. An embarked security team aboard the ship returned fire on the suspected pirates during the initial attack. Subsequently, Spessart pursued the skiff while providing additional details of the attack to a variety of international naval vessels operating in the area. A number of naval ships and aircraft joined the pursuit, including: the Dutch frigate HNLMS Zeven Provincien, an SH-60B helicopter assigned to the Spanish warship SPS Victoria, a Spanish P-3 maritime patrol aircraft, two Marine Corps helicopters from the Combined Task Force (CTF) 151 flagship USS Boxer (LHD 4) and the European Union’s CTF 465 flagship, the Greek frigate HS Psara. Supported by an AH-1 Cobra attack helicopter and a UH-1 Huey assigned to Marine Medium Helicopter Squadron 163 (Reinforced), “Evil Eyes,” embarked aboard Boxer, the international naval forces contained the armed suspects until Psara arrived with a German boarding team. Upon boarding the skiff, the team found seven suspected pirates and their weapons. The suspected pirates were disarmed and transferred to the German frigate Rheinland-Pfalz where they will remain until a final determination is made regarding potential prosecution. While this event showcased the incredible international naval capabilities operating in the Gulf of Aden, it also highlighted the complexity of counter-piracy operations. The crew of Spessart and the embarked security team provided the critical first line of defense, utilizing defensive measures that are essential for all ships operating in the region. Moreover, nearly five hours transpired between the time Spessart’s armed security team thwarted the initial attack and when an armed boarding team was within range of the pirate skiff. In the interim, armed coalition aircraft kept the suspected pirates from getting away. Hey, I’m just really glad that this fleet oiler had “an embarked security team” aboard. Imagine how red the faces in Berlin would have been if they hadn’t ... because then the Spessart, a naval vessel [in what is pretty much a combat zone, or at least one that meets my definition of “in harm’s way"] would have been captured. By pirates. Egg, face, much? Phew! !